Enjoy the best Android rooting experience with just one click! TunesGo helps you to root your Android phones/tablets within a few minutes. High success rate and ZERO risk is garanteed! TunesGo is simply the best Android Root tool in the industry with everything just simplified. All you need to do is to connect your Android, find the "Android Root" button and click it. The advanced Android Root Module recognise and analyse your Android device and choose the appropriate Android-root-plan for it automatically. You don`t need to worry about data loss or other issues. Make yourself a cup of coffee and watch the power of your Android getting unleashed - a few minutes will do! 1. Connect your device to computer. 2. Find "One-click Android Root" in Toolbox and click it to root your device. 3. Android device is successfully rooted! Don`t know why you should get your Android phone rooted? 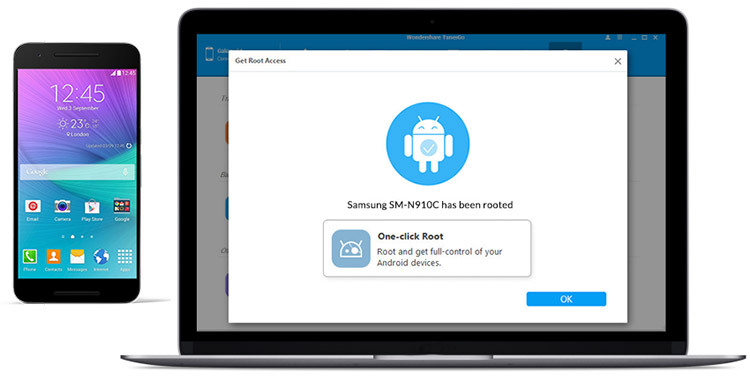 If your phone is slow, packed with ads and malware that drains your battery fast, let`s see what benefits you could take after you root your Android phone with the one-click Android root tool. Reduce unnecessary RAM and CPU usage to get better performance. Block all the annoying ads in your downloaded apps. Extend battery life with your customized Android device. Enjoy thousands of “incompatible” apps from Play Store and other sources. Uninstall useless, annoying, space-wasting apps that are preinstalled by manufactures. Customize ROMs to change your Android themes and settings completely.